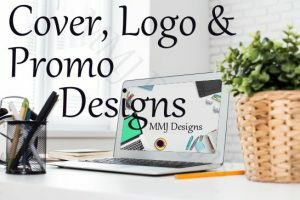 Want a cover, logo or promo design that makes someone stop to see more? We create covers, logos and promo designs that provide a visual that will go along with your words. An eye-catching design will bring a reader in to look at what you’re offering. We create a visual that portrays your message. Check my portfolio for cover & logo designs , print cover designs, and promo designs. Most prices start with a base price. Sometimes there is an additional charge for images depending upon what you’re purchasing. Cover art design based on royalty-free stock photos. If you are in a hurry and need a cover quickly we do our best to provide you with a solution customized to fit your needs. Includes 2 design choices and 2 changes to chosen design. This is for creating the first cover in a new series (includes series logo design, 2 design choices and 2 changes to chosen design). Series covers based on existing series design created by MMJ Designs. Includes 2 designs and 2 changes to design choice. Additional Cover Changes (per change): price quote provided if more changes requested. This is for creating the first cover in a new series (includes 2 design choices and 2 changes to chosen design). Ads: price quote given upon more information provided. Postcards & Flyers: price quote given upon more information provided. Posters & Banners: price quote given upon more information provided.